Devil Survivor 2 caught my interest with its odd premise: humans battling demons with phone apps that summon other demons and tell the future. I was curious to see where it would go, but just four episodes in and my patience was at an end. While I could easily make an argument for why the show's plot is too ridiculous to suspend disbelief (demons from cell phone apps, a secret government agency devoted to using demons from phone apps, demons that look like ice cream cones, ect) I'll leave that alone. If other aspects of a show are captivating, it's worth dealing with a unbelievable premise. However, if you look past the goofy plot and the rushed pacing, you stumble face-first into this anime's great weakness: its characters. We have the standard best friend who is amusing and useless and amusingly useless. "He summons tiny demons lololol." Perhaps he'll develop over time, but I won't be sticking around to find out. As it stands, he's pointless and utterly unoriginal. Next we have the inhumanly endowed high-school girl. Honestly, why? Just why? Every time we see her I wonder if she's running a service to smuggle cruise missiles across the border in her jacket. As for personality, she's meek, quiet, and devoted to the main protagonist immediately after meeting him. Of course. Oh, but to give her some use the writers let her summon very powerful demons because otherwise her only purpose would be carrying around those bouncy...tracts of land. But in the end it comes down to the protagonist. The hero of the story. The main man. And who fills that role in this anime? A random high school boy who inexplicably can summon a demon more powerful than anyone. He's got the personality you've seen a million times before: an unlikely teen given god-like powers who uses them to (you guessed it) protect his friends! As bad as this was, I was willing to put up with it in the event his character evolved some depth. All that ended in the fourth episode when, confronted by an opponent he couldn't beat in one shot like every previous opponent, our hero clenches his fist, yells mightily, and magically increases his power to destroy the previously untouchable juggernaut. Did he pay a price for this power? No. Did he do anything to earn it beyond yelling? No. Is there any reason he should have the power in the first place or be able to control it better than everyone else? No. He's just a walking plot device who just has to throw a fit and scream to power up and blow away the enemy. I've been watching anime for years, and I just have no patience for writers who give their protagonist unlimited power, randomly increasing it at just the right moment so they can beat whatever unbeatable foe they're facing. It's lazy writing. Instead of having a limited power and having to come up with intelligent ways of using that power to defeat stronger enemies, the writers just amp the hero's strength and call it a day. No intelligence required when you've got a handy dandy plot device like that to rely on. Now, if you don't care about cliche characters and overused, mindless plot devices and just want to watch a bunch of demons beat the crap out of each other, this show will do you nicely. If you want a show where the plot provides real tension and the characters aren't copy/pasted from popular shonen manga, I heartily recommend looking elsewhere. This is a really good anime in my opinion it's the best one I've seen and I really like post apocalyptic anime's . It also had me on edge the whole time. and when I heard it's based off a game I got really exited are going to look for the to play it. They really do have an app for everything, except character design. Judgement day has come. Humanity has one week to fight for it's survival or die trying. The survivors can remake the world in their own vision, the new world will be as they want it. But who has the right to remake humanity as they see fit? Hibiki Kuze: Main protagonist. Capable of summoning powerful demons. Daichi Shijima: Hibiki's best friend and classmate. Io Nitta: Classmate of Hibiki and Daichi. Capable of summoning some powerful demons. Yamato Hotsuin: Leader of JP's. Capable of summoning very powerful demons. Believes in the concept of 'Might makes right'. Alcor: AKA "O Anguished One" to himself. Watches over humanity. The characters of this anime are its biggest weakness. Put simply, you can guess what each character is going to do in every situation before they do it. This detracts from the anime quite a bit as it becomes more predictable and less attention grabbing, seeing as you already have a basic idea of what will happen next. Each character also fits their role too well, if that makes sense. That is part of the reason they are so predictable. They are characters with one-track minds, incapable of doing something to surprise the viewer and never developing past how they were introduced as. As if they were robots programmed with a certain personality code. . .
No character truly felt human enough. On the subject of characters though, I will give one thing I liked about it: They actually let people die! I enjoyed this because the show takes place as an apocalyptic world, one where not everyone shall survive. I know I sound morbid saying that, but come on we all know people would die in any form of an apocalypse. Overall though, I would have much preferred different characters because they were personally my biggest flaw with this anime. The story is simple: Humanity is under attack from another race known as Septentriones whose intent is to wipe out humanity. This is humanity's judgement, for seven days they must survive and defeat the Septentriones allowing for an audience with Polaris (An equivalent to a God) who controls time and space. The survivor(s) can then make one wish to remake the world as they see fit. To fight back, humanity managed to obtain a "demon" summoning app (It actually summons many mythological and religious beings, all of which are referred to as demons) to summon beings to fight back against the Septentriones. The pacing of this show was done very well. It takes up one week's time and each day is two episodes long. The plot was carried out efficiently due to the pacing and didn't feel like they rushed action in to make for a more exciting episode. For the time-span used for the show, it seemed well done with how they paced the episodes. I actually happened to like both the opening and ending and stuck around to listen to them each episode. and I could easily recognize them if heard elsewhere. I also really enjoyed one aspect about the ending in which all characters who had died disappeared from the ending. The background music was also done well in the aspect that it went along with the mood well: however, I will say it was nothing special and I doubt I'd recognize the background music anywhere. I had no problems with the artwork at all. It wasn't anything great, but it was far from bad. The characters and scenery designs were well done and nothing seemed out of place. I did find this anime to be enjoyable. It had enough going to keep me entertained. Would I recommend going out of your way to watch this show? No, I would not. While I was kept entertained, this show is nothing special. Not all that great, not all that bad. I wouldn't recommend watching this anime unless you're bored and need something to pass the time with. -You guessed it, bad characters. They really are that bad. Reviewed by RAZ, Edited and Revised by HG. This new anime has perfect graphics and the action is never left out! I cant wait for more to come and it is most defiantly one of my favorite anime's! I recommend this anime to anyone who likes Ano no Exorcist or animes with demons such as Inuyasha. 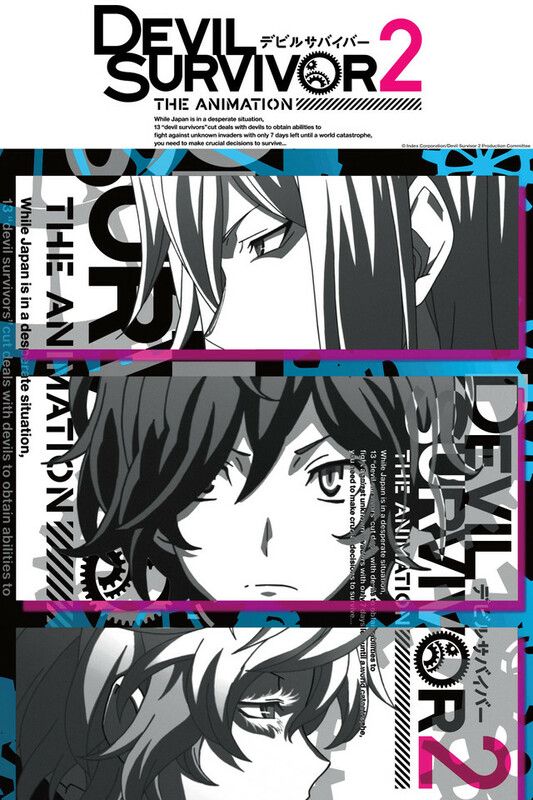 Just like Persona 4 The Animation, Devil Survivor 2 hits the ground running. The first episode is a general introduction episode where glimpses are shown of several of the main characters and the summons that they acquire through a computer system. This show is beautifully animated and the character designs as well as action scenes look great. After just one episode I can safely recommend it to anyone who is a Shin Megami Tensei fan or anyone looking for a good cerebral action anime to watch. Reviews on this series have been pretty mixed, but it definitely topped my list for the year. It's unique, and it doesn't play too much to anime tropes; the characters are all realistic and it doesn't go for cheap laughs. The ending keeps me from giving it a full 5, although there are only so many ways it could have ended, but for the most part it's a serious show where every decision has consequences, and that applies to every character. They all act true to their characters and true to the emotions an apocalypse event would engender. If you're looking for something that's not "more of the same" this is definitely one show worth watching. Pay careful attention to the intro/outro sequences too As an aside, the end theme (Be by Song Riders) is one of my favourite pieces in a very long time. Let me begin by stating that I am a big fan of the Shin Megami Tensei franchise in general, as well as the Devil Survivor series in particular. DS2 manages to pack a ton of plot and characterization – including a fine cast of secondary characters that will keep most players coming back for more – into a single DS cartridge (or 3DS cartridge, since there is a remake on the way). Because of that, I had high hopes for the anime, and I admit that there are several things it does well: faithful character designs (especially for the non-humans), high production values, and a fine soundtrack that includes my favorite ED of the entire Spring 2013 season. It also offers a sympathetic interpretation of a main character who has heretofore been only a silent protagonist (albeit one that the player can grant a fun, offbeat personality). Sadly, in exchange, it shafts the rest of the cast, taking the rest of those well-made characters and doing next to nothing with them, barely touching upon any of their arcs and giving the audience no real time to feel anything for them. This is a tragic loss, considering what might have been. If you want a taste of this universe, watch the show and its bare-bones, most-parts-missing take on the story, but, if you want to see what all of us have really been talking about, pick up either version of the game ... and prepare to be blown away. 1 Star. I had recently played through the two Devil Survivor DS games, so I was psyched to watch the anime. I've watched two episodes so far and currently I'm not very impressed. Maybe it's because of my bias to the DS games, but the plot seems a bit rushed and shaky. Especially since they put the main character in such a high pedestal right at the beginning, where as in the game its more of a steady incline. My opinion would probably change after I go through the whole series. I'm kinda of a bit bothered by the change in plot, but that happens a lot with game adapted anime that have several endings. But right now I'd say this is a passing anime. For those who want a solid anime with a great plot - you could try this one out, but you won't be too impressed with the first few episodes. I'd suggest if you want more out of this series to go play the DS game. The plot is absolutely rubbish. That's how I particularly feel about the anime not because of its style, but because everything is too rushed. As a retelling of a story that should delve deeper into plot and character development we learn very little about the characters that make them who they are and why they make the decisions they do. Signing up Devil Survivor 2 for only thirteen episodes was a poorly executed decision that helped butcher the anime's potential. They input multiple mechanics into the game that should help drive the protagonist's decision and ability to do something about it, but they throw it all down the drain. For every supporting character they introduce, they bring a brutal death to them shortly after. I'm sorry, but that isn't acceptable. It doesn't make the anime nor its plot particularly memorable since every character aside from the protagonist's group is dying left and right. People who compare it to Persona 4 the Animation and praise it to be just as good or better seem to be a bit misguided at the premise of Devil Survivor 2. In Persona 4 the Animation, the investigation team succeeded in their goal of saving the people they had to save. In Devil Survivor 2 the Animation, the idea of death clips is completely pointless as the main goal of the characters is to defeat the Septentriones. For those of you who haven't actually played the game, the Septentriones were the bigger picture of the entire plot, as Hibiki and his entire group's original goal was to survive the ordeal that was placed before them. As they progressed through each day trying to survive, they encountered JPs and eventually concluded that the best way to survive was to defeat the Septentriones. That being said, they encountered more survivors that would help to support them on their mission: these survivors being the supporting characters that have been immediately killed off =/. The anime misses its biggest point, which is even part of its title. Devil Survivor 2 the Animation doesn't even live up to its name. It's just a story where the main character has to beat up the villain and essentially win. There's nothing satisfying about the anime as each mission is essentially a failure as the characters meant to support the protagonist die left and right.